On a beautiful sunny day in the city of Luputa, Democratic Republic of the Congo, the 10th Congolese stake in Africa was organized. More than 1,800 members gathered from villages and farms — some traveling by riding bikes and others riding in the backs of trucks — to the Church building on June 26. Most came walking, some even for 6-8 hours, just to attend the conference. Assigned by the Quorum of the Twelve, Elder Paul E. Koelliker and Elder Alfred Kyungu of the Seventy met with local leaders and members to call the new stake presidency. 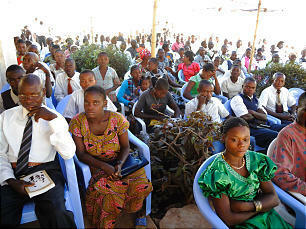 The growth of the Church in this somewhat remote part of central Africa is quite a remarkable story. For the previous five years, since the district was organized, there have been no full-time missionaries assigned to these villages. Each of the branches had only branch missionaries who worked under the leadership of the district and mission presidents.